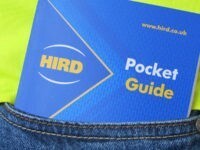 Hird was commissioned by a demolition contractor to support the removal of two bridges and a steel and glass escalator at a shopping centre as part of a refurbishment programme. 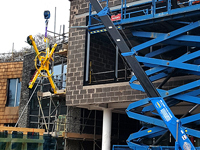 Hird deployed a Valla pick and carry crane and a UNIC spider crane to carry out different tasks during this mini crane lift, working in partnership with other contractors. Excellent lift planning so the project will run smoothly, with the highest priority put on health and safety. Two first floor walkways and a steel and class escalator inside the shopping centre were being demolished. A site visit was carried out before the move, to fully plan how it would be carried out. Hird provide method statements and risk assessment management systems (RAMS) for this contract lifting project. 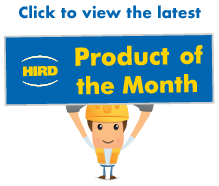 Because the tiled flooring needed to be protected, Hird laid specialist rubber matting that spread the load weight of the mini cranes, and prevented any chance of the flooring being damaged. A Valla 180E mini crane, controlled by an experienced Hird mini crane operator was deployed to support the removal of the concrete bridges. The bridges were both about 4.5m long and 1.2m wide. They had to be cut into 18 separate sections, using specialist saws. While the sections were being cut, they were supported using slings by the mini crane. Once the cut was complete, each section, weighing about 3 tonnes, could be lifted away. The pick and carry mini crane then transported the load along the specialist matting, placed on a pallet and taken out of the shopping centre with a forklift truck. A UNIC URW-706 mini spider crane was used to support the demolition of the escalator. 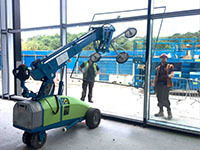 The crane was fitted with a P-11104 glass vacuum lifter to support 24 glass panels while they were unbolted. They could then be lifted from the escalator. Working from two lift positions either side of the escalator, the spider crane then lifted away its steel frames. It was then used to finally lift out the escalator’s electric motor, the heaviest item to lift, at 1.5 tonnes. The complete demolition process took two weeks, a process made longer by the need to work only at night, from 7pm to 7am. 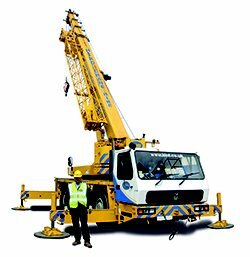 This mini crane combines an impressive maximum lifting capacity of 18 tonnes with a compact design. At only 2.2 metres wide, it was an ideal option for working within the confines of a shopping centre. It is electric powered, so also fume-free. This mini crane has a maximum lifting capacity of 6 tonnes (at 3m) and a maximum working height of 19.5 metres, so was ideal to support the dismantling and removal of the escalator. Again, at 1.670 metres wide when in transport configuration, it could be easily moved into position inside the shopping centre. It is also electric-powered so fume-free. The Wood’s Powr-Grip P11104 has a 320kg lifting capacity. 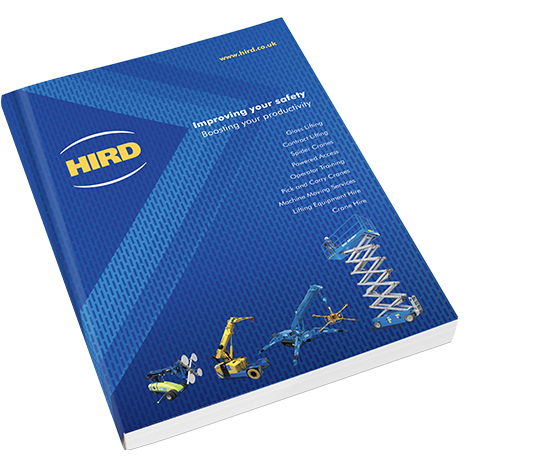 It has four vacuum cups, set in a line, and excellent safety features, making this one of Hird’s versatile glass vacuum lifters, and ideal for this task.